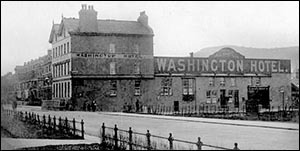 The original Washington Hotel was built in the early years of Llandudno’s development as a resort but at the opposite end of the promenade from the other early hotels. As the seafront hotels gradually extended eastwards, their frontages were neatly aligned. However, the Washington was closer to the beach than the rest, interrupting the building line’s sweeping curve. The solution was to demolish and rebuild it in 1925! The new Washington Hotel was designed by Arthur Hewitt, whose other works included the Palladium Theatre and Clare’s Department Store. He was a Home Guard commanding officer in the Second World War. The building has a distinctive dome above its corner entrance. It became a nightclub in the 20th century but closed in 2012. In 2017 work began on refurbishment prior to its opening as a restaurant. A giant low-relief map almost covers one wall upstairs. It was sculpted by Jane Evans in 2017 and is based on a “New and Correct Map of North Wales”, drawn in 1784 by Thomas Condor. The original building (pictured left) existed by October 1870, when John Hughes of the Washington Hotel wrote to local gentlemen to ask if they’d be prepared to donate towards construction of a new carriage drive around the Great Orme (the Marine Drive). In 1881 the hotel’s barman looked out during a thunderstorm and saw lightning strike dead a local carriage driver, Thomas Jones, about 30 metres from the hotel. When the victim was examined in the hotel’s stable, the only mark on his body was a slight singeing of hair under one ear. The lightning had damaged the carriage and injured the horse. Robinson Kay, the hotel’s proprietor, received one of the earliest speeding fines in Wales in 1899. He was charged with “furiously driving his motor car” in the Conwy Valley. One witness estimated the speed at 20mph (32kph) or more. Mr Kay said he never drove faster than 8mph (13kph).